There are numerous threats to waders in Australia and in other countries of the flyway. In many parts of South-east Asia the birds are hunted and there is widespread habitat loss through coastal reclamation and industrial development, especially in China and South Korea. In Queensland, there is inadequate protection of roost and feeding sites and threats from pollution. Australia is a signatory to international treaties aimed at protecting migratory waders including the Ramsar Convention (Convention on Wetlands of International Importance especially as Waterfowl Habitat) which promotes wetland conservation, and the Bonn Convention (Convention on the Conservation of Migratory Species of Wild Animals) which provides a multinational framework for the conservation of migratory species. In the East Asian-Australasian flyway, 15 of the 22 countries in the flyway have signed the Ramsar Convention. Australia also has special migratory bird agreements with three countries in the flyway - Japan, China and Korea. Moreton Bay and 18 Mile Swamp, the longest wetland of its type in the world, are listed as Ramsar sites for special protection and sustainable management. 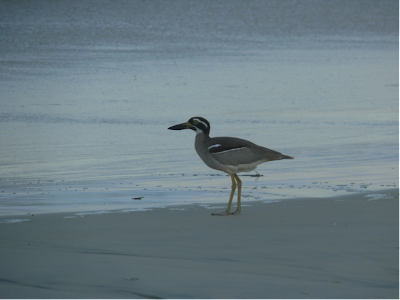 A Shorebird Management Strategy for Moreton Bay was released in 2005 by the Queensland Government. Within Moreton Bay Marine Park, the Marine Parks (Moreton Bay) Zoning Plan 1997 contains provisions for managing shorebirds. The Queensland Parks and Wildlife Service (QPWS) is the agency responsible for the management of the marine park including its shorebirds and their habitat. In addition, state and regional coastal management plans provide a framework for managing shorebirds in coastal areas including the marine park. Outside the marine park, the responsibility for protecting shorebirds is a matter for landholders, local governments and other land managers. FOSI members are very concerned to ensure that the threats to Stradbroke’s shorebirds are recognised and addressed. While it’s great that 18 Mile Swamp has been included in the new national park, excessive water extraction for mining and water reticulation poses an ongoing major risk to 18 Mile Swamp and Stradbroke’s ground water systems. The integrity of 18 Mile Swamp is at risk from deep dredge mining at Enterprise mine next to the swamp and the impact of the Yarraman mine near the northern Key Holes. Shorebirds, especially our resident birds, also face continual threat from vehicles on beaches particularly when driven at high tide or above the high-water mark. Destruction of birds and nests by dogs, cats and foxes and rough human feet is another ongoing threat while the proposed development and release of extra land at Amity and Flinders Beach in the vicinity of key migratory shorebird habitat must be monitored closely to ensure that adequate buffer zones are put in place to protect the bird’s habitat. A shy creature, distantly related to the elephant, which communicates by chirps, whistles and barks –­ the dugong may be one of Moreton Bay’s least seen and most fascinating inhabitants. Approximately 1000 dugongs live in the warm waters of the sheltered and shallow bay. Globally, however, there are serious threats to this gentle animal’s survival. The World Conservation Union lists the dugong as vulnerable to extinction. The name dugong derives from a Malay word meaning Lady of the Sea, yet elsewhere they are less-flatteringly referred to as Sea Cows, due to their diet of seagrass. They are the only marine herbivorous sea mammals in the world and have been observed to suckle their young for up to five years, even though calves start eating seagrass at three months old. Solitary animals, they travel alone or in pairs for most of their 70-year lifespan, although they have been seen in herds of 10 to 300. Swamps fringe the Northern, Eastern and Southern shores of North Stradbroke Island. The Eighteen Mile Swamp, a great trough in the sand lying seaward of the huge dunes of the main sand mass is kept full of fresh water by seepage from the sand mass rather than surface run off. Straddie is the southernmost high dune sand mass in Australia and the second–largest sand island in the world after the World Heritage Listed Fraser Island. This swamp teems with life and interest and is so special that it is included within the Moreton Bay RAMSAR site, recognised as one of the world’s premier wetlands. It is in fact the longest wetland of its type in the world. Where to see Shorebirds on Straddie? National Park & Mining - Compatible?